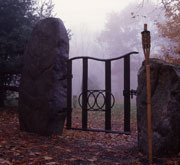 Columcille Megalith Park is located in Bangor, Pa. in the Appalachian Mts. The park took roots in 1978 as the owner, William Cohea Jr., opened up his property to welcome people of all faiths and traditions interested in renewal and transformation. Megalith stones from the Appalachian Mts. were brought and erected on the land to provide a public sanctuary for quiet meditation. The park is rooted in Celtic spirituality and was inspired by the Isle of Iona off the coast of Scotland. The Samhuinn Celtic New Year is celebrated on the last day of October. It marks the end of summer and the “night of the dead”, a time for the spirits of the departed from the previous year to pay one last visit to their relatives before departing for the other-world forever.Our field trip included this day of celebration. A rainy forecast caused a few people to bail out. We started with a hearty lunch at Zoto’s Diner in Line Lexington and arrived at the park later in the afternoon for some “wet” images of this playground of myth and mystery. The candlelight celebration started at 7:00 and the rain had stopped during the entire ceremony. I wonder if the spirits had anything to do with that!! Although the photography was limited, the spirituality was truly enjoyed. I will show some of my images from previous trips to the park to give you an idea of the amazing structures created here. You can visit their website at www.columcille.org.